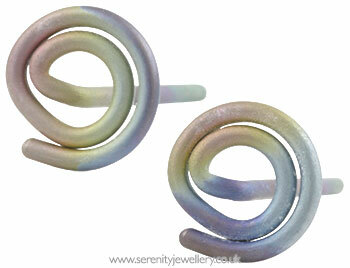 Hypoallergenic soft rainbow titanium 5.5mm spiral stud earrings with titanium butterfly backs. 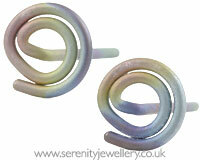 Really love these studs - can wear them every day to work but they're a bit more unusual. It's also the first time in years I've been able to wear earrings at all - the titanium is a revelation! Only given 4 stars not 5 as the post is very long, but it's a minor quibble.